From black tie to smart casual and daytime attire, dress codes can be a little confusing if you’re not entirely familiar with each one! So, we decided to break down each one to give you (and your guests) a handy cheat sheet to make sure you achieve the right look for your wedding. Keep reading for an in-depth explanation of each dress code style, along with some of our top dress code tips to ensure your attire is on point! WHY ARE WEDDING DRESS CODES IMPORTANT? First things first – why do weddings need a dress code, anyway? Is your outfit really going to have an impact on the overall event? Well, in our opinion, dress codes actually exist to make sure you feel your very best! Feeling under or overdressed in a room full of people can definitely put you in an uncomfortable position. A dress code helps to prevent this by giving you a helpful guideline to follow. A wedding dress code can also contribute to the overall mood or theme of the event. For example, an elegant cocktail wedding complete with champagne towers and chandeliers can be brought to life with guests also donning gowns and tuxedos. If guests were dressed in more relaxed or casual attire, this wouldn’t align with the desired ambience. Couples generally set their wedding dress code to reflect the look and feel they have planned for their celebration. Choosing your wedding day attire according to the dress code will really help to elevate the entire setting! So with that in mind, let’s run through some of the most common wedding dress codes, and some outfit suggestions for each one. A black tie dress code indicates that the event is going to be very formal. If the couple have specified a black tie dress code, this means dressing to the nines in your absolute best attire – think about the kind of outfits you’d see on a Hollywood red carpet or Gala dinner. For ladies, a floor-length evening gown would be the most appropriate choice to suit a black tie event. A mid-length dress can also be suitable if the style is formal and sophisticated, but you’d definitely want to steer clear of a mini dress or separates for a black tie occasion. Dark, rich colours like black, navy, emerald and red are often best suited for this dress code as opposed to lighter tones. Heels, jewelery and formal hair and makeup styling are also recommended for a black tie wedding. When in doubt, opt to dress up rather than down – it’s best to be overdressed than underdressed within this kind of setting. For the guys, a black tie dress code means a formal, tailored suit and bow tie with a fitted tuxedo or dinner jacket, along with leather dress shoes and a well-groomed appearance. When it comes to the color of your suit, black or dark navy is the most appropriate choice. Formal or black tie optional is just a slight step down from black tie. Although an evening gown would definitely still be suitable, you could also opt for a mid-length gown, dressy top and skirt, or even an elegant ankle-length jumpsuit. You’ll still want to complete the look with formal hair, makeup and accessories. For the guys, a dark suit jacket could be worn in place of an overly formal tuxedo jacket, although the overall look should still feel refined and sophisticated including dress shoes and a tie. A semi-formal or cocktail style dress code opens up some more options for your wedding attire. This kind of dress code is just slightly more relaxed than a formal event, and is often the chosen dress code for cocktail style weddings. 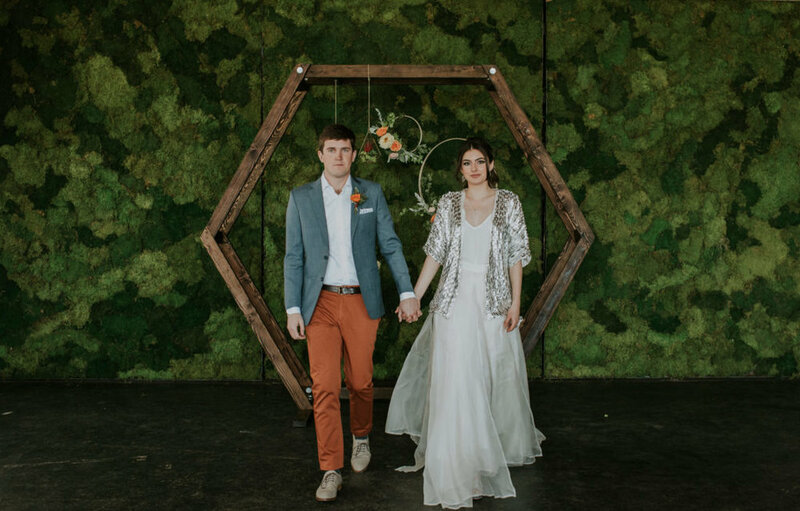 Although you can still wear an evening gown or tuxedo jacket, you’ll probably feel slightly overdressed compared with other guests and the style of the wedding (or worse, upstage the bride!). Instead, think about what you might wear out to a special dinner at a fancy restaurant. For ladies, a mid-length cocktail style dress is generally the most appropriate option, or a top and skirt combination. You’ll likely need to take some cues from the actual venue and season of the wedding, too. For example, you might want to include a pop of colour or floral print for an outdoor garden wedding, while a dressy jacket might be required during the cooler seasons. Heels and formal accessories are definitely still a-okay for a cocktail wedding, although you might opt for a more relaxed heel style rather than 6-inch stilettos! For guys, a dress shirt and dress shoes with dress pants or even chinos are recommended, with a tie, vest or jacket being optional. A smart casual dress code can often be the most confusing, sitting in-between formal and informal! Think about the kind of outfit you might wear to a formal brunch or business event – you don’t need to go overboard with your attire, but you still want to look polished and put together. For women, a more relaxed style dress, top and skirt combo or jumpsuit can be well suited for smart casual attire. Pants (but not jeans!) and a dressy top are also appropriate for this kind of dress code, with low heels or wedges being your best bet for appropriate footwear. Guys can ditch the formal jacket and tie altogether, and opt for trousers or chinos with a button-up shirt. A lightweight blazer or neutral-toned jacket can also work well during the cooler months. Dress shoes are still recommended, although you might opt for a slightly more informal style like boat shoes or loafers. A casual dress code usually means that the wedding is going to be a relaxed and low-key affair, like a beach wedding or a backyard celebration. If the couple have set a casual dress code, this means they aren’t expecting you to dress to the nines as it won’t suit their vision for the day. However, casual dress doesn’t mean throwing on an outfit that you’d wear down to the supermarket! Instead, think about the kind of outfit you might wear to a birthday lunch or a night out to dinner while on holidays. A casual or daytime dress code is most often seen at weddings taking place during the warmer seasons. For ladies, a summery dress or maxi skirt and top will suit a casual dress code perfectly. Try to steer away from heavy, formal fabrics like silk or velvet – lightweight fabrics will better suit the tone of a casual, daytime event. When it comes to footwear, flats or wedges are generally both suitable, but if the wedding is taking place outdoors then you might want to be mindful of this and choose something comfortable that won’t sink into the grass. For the guys, a button-up shirt with chinos or even tailored shorts are appropriate for a casual or daytime dress code. Don’t go too casual by wearing a t-shirt, jeans or thongs – remember, it’s still a wedding and you want to make an effort to scrub up nicely for the happy couple! Keep it comfortable. Whether you’re donning a formal evening gown or a relaxed sundress, remember that you’ll be spending a large portion of the event mingling and dancing. At the end of the day, the couple wants to have an amazing time celebrating with you – so make sure your chosen outfit allows you to move around comfortably! Take cues from the venue and season. For example, if the wedding is taking place outdoors during spring, opt for bright, light colours. This will also help contribute to the overall look and feel of the event. Don’t wear white! We think this one probably goes without saying, but wearing a white dress is a definite no-no for a wedding. Leave that for the bride, and the bride only. Choosing the perfect wedding outfit doesn’t have to be difficult when you know what each dress code really entails. From black tie to casual and everything in between, remember that dress codes are there to help you feel comfortable on the day – so it’s best to stick to the specified dress code as closely as possible. Simply keep this wedding dress code cheat sheet handy for your next wedding guest appearance and you’ll have no problems selecting an outfit that helps you feel your very best!